A guide to progression, keying, flagging, and access within the Prophecy of Ro expansion. The Prophecy of Ro expansion was announced on January 3, 2006, and went live on February 21, 2006. The initial expansion announcement may be found here. The initial patch message may be found here. Mayong Mistmoore's release into godhood has turned the gods' focus back to the mortal realm. Druzzil Ro foresaw the devastation of the world and in turn beckoned all mortals to her Plane of Magic, a plane ruled by her creations, the scrykin. The scrykin have a problem, though. As they age, they succumb to madness, paranoia, and instability -- something which led the first born scrykin, Daosheen, to lock himself in the tower of Skylance. As the elder scrykin continued to deteriorate mentally, the dragons of Relic assumed more political power. They, however, are at odds one another as they each want control of the magical channeling platforms built within the city. And so it is the second born scrykin, Porthio, who has assumed the role as governor of Relic while at the same time remaining focused on his studies. In addition to the Plane of Magic portal, another passage appeared in Freeport, one which leads to the home of Sullon Zek -- the Plane of Rage. It is said that when one mortal kills another in a fit of rage, the killer is sent here when they die. The Seething Wall which lines the plane covers the killer in an all-consuming darkness. They feel cold, leathery flesh, and the pinch and scrape of armor against their bodies, crushing them from every direction. With the stench of death in the cold air and the calling of Sullon Zek's rage, they soon feel an urgent need to destroy and vent their unrelenting rage, as well as a desire to fight for Sullon Zek and earn her respect. Sullon Zek remains in the tower of Razorthorn within her plane's stronghold, alongside those who are most dedicated to increasing their rage and learning how to focus it. Another magical passage formed in the Desert of Ro. Druzzil Ro wasn't the only god to take action after Mayong Mistmoore was released into godhood. Tunare, too, saw the need to beckon mortals to her realm. Using rains from Karana and magic from Druzzil Ro, a sandstorm was created in the desert, revealing the ruins of the Elddar city Takish-Hiz. Also created was a portal into the past and the glory of the Elddar Forest and great elven city as it stood in the Age of Monuments, before Solusek Ro created the Serpent's Spine Mountains and turned the forest into a desert. There is one god who has already fallen to the corruption of Mayong Mistmoore. She is Ayonae Ro, the ruler of the once-beautiful Plane of Music, a place which has turned into a dark, bloody cesspool of terror and rage while Ayonae remains holed up in the plane's tower of Deathknell. The very power of mortals that the gods despised for unleashing Mayong Mistmoore into godhood is being called upon to save them and the world. A list of Prophecy of Ro zones may be found here. The Plane of Magic is entered through a portal in the top floor of the Academy of Arcane Sciences in West Freeport. The Plane of Rage is entered by clicking on the statue of Sullon Zek behind the arena in East Freeport. The Elddar city and forest of Takish-Hiz are entered through a portal in South Ro. Wizards and Druids are able to port to Arcstone. Arcstone is also a destination in the Guild Hall portal. Druid and Wizard Arcstone port spells are available from Scribe Luritem in Arcstone. Complete this minor quest in order to buy from him. Complete this task given by Lilthill`yan`s Ghost at location -545, -365 in the Ruins of Takish-Hiz. Bards receive Spell: Aura of Insight. Berserkers receive Skill: Aura of Rage. Clerics receive Spell: Aura of the Zealot. Druids receive Spell: Aura of the Grove. Enchanters receive Spell: Beguiler's Aura. Magicians receive Spell: Earthen Strength. Monks receive Tome of Disciples Aura. Necromancers receive Spell: Dark Rune. Paladins receive Spell: Holy Aura. Rogues receive Skill: Poison Spurs. Shamans receive Spell: Idol of Malo. Warriors receive Skill: Myrmidon's Aura. Wizards receive Spell: Fire Mark. Complete the three tasks given by Spirit of Ao the Fourthborn at location +196, -962 in Arcstone (at the Relic portal). #1 - Skylance: The Library, which takes place in the Skylance library. #2 - Skylance: The Oubliette, which takes place in the Skylance oubliette. #3 - Skylance: The Laboratory, which takes place in the Skylance laboratory. Bards receive Spell: Aura of the Muse. Beastlords receive Spell: Spirit of Oroshar. Berserkers receive Skill: Bloodlust Aura. Enchanters receive Spell: Mind Shatter. Magicians receive Spell: Iceflame Guard. Monks receive Skill: Master's Aura. Necromancers receive Spell: Mind Flay. Paladins receive Spell: Blessed Aura. Rangers receive Spell: Elddar's Grasp. Rogues receive Skill: Poison Spikes Trap. Shadowknights receive Spell: Decrepit Skin. Shamans receive Spell: Ghost of Renewal. Warriors receive Skill: Champion's Aura. Wizards receive Spell: Chaos Flame. 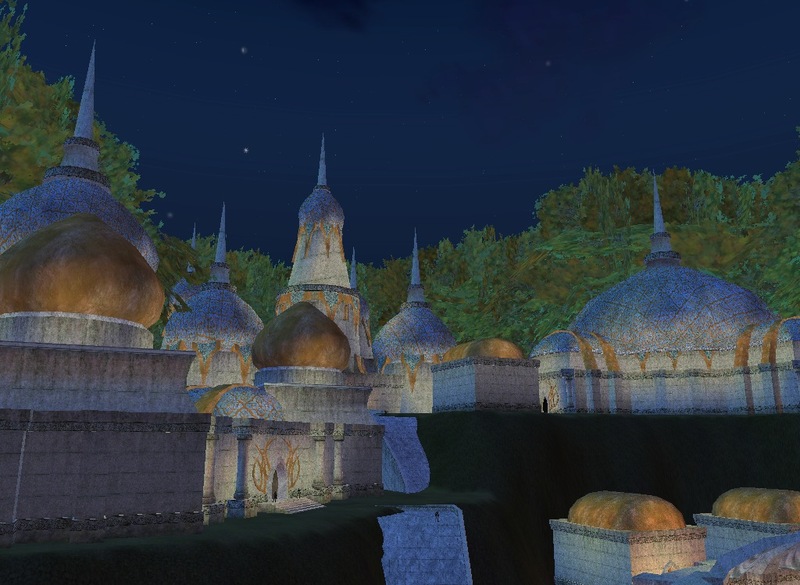 Complete the three tasks given by Tak`Valnakor at location +6885, -1350 in North Ro. #1 - The Key to the Past, which takes place in the Root of Ro. #2 - The Burning Prince, which takes place in an instanced Ruins of Takish-Hiz. 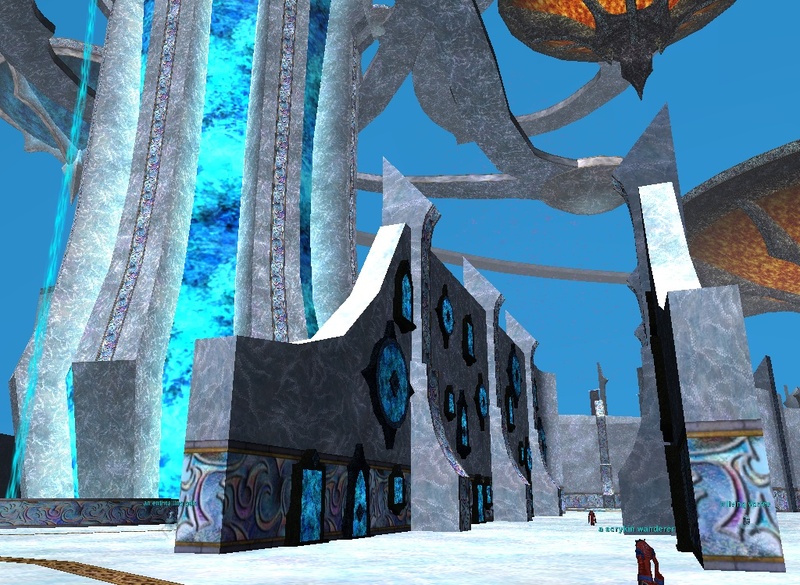 #3 - Message from the Past, which takes place in an instanced Ruins of Takish-Hiz. Clerics receive Spell: Aura of the Pious. Druids receive Spell: Aura of Life. Enchanters receive Spell: Illusionist's Aura. Magicians receive Spell: Rathe's Strength. Necromancers receive Spell: Death Rune. Shamans receive Spell: Idol of Malos. Wizards receive Spell: Fire Rune. Complete any one of these tasks for your spell/skill from the Plane of Rage. Bards receive Spell: Arcane Aria. Clerics receive Spell: Elixir of Divinity. Enchanters receive Spell: Ward of Bedazzlement. Magicians receive Spell: Spear of Ro. Monks receive Skill: Heel of Kanji. Necromancers receive Spell: Grave Pact. Paladins receive Spell: Ward of Tunare. Rangers receive Spell: Scorched Earth. Shadowknights receive Spell: Theft of Agony. Shamans receive Spell: Nectar of Pain. Wizards receive Spell: Ice Block. Note: If you are in the same task as someone doing the Enraged Flesh Armor turn-ins to Maelin for the "Become the Vessel" task, you may bypass all steps up to that point and simply say "Enraged Flesh Charm" to Maelin to receive the Razorthorn key. Complete the Saga Skins task which opens up after looting a skin from an NPC in The Devastation. Complete the Preparing Your New Skins task from Grand Librarian Maelin. Complete the Become the Vessel task from Grand Librarian Maelin. After someone in the task delivers their five Enraged Flesh Armor pieces to Maelin, everyone in the task receives a flag. After receiving the flag, go to Maelin and say "Enraged Flesh Charm" to Maelin. With this item, you can request the "Samples of Corruption" task. This item is optional for Theater of Blood access, but a requirement for Deathknell access. The seven tasks here may be done out of order. The NPC hails and turn-ins cannot. To be safe, follow all NPC dialogue - no short cuts! Hail Arch Mage Galsin at location -180, +1465 in Arcstone (inside a tent). To Galsin, say "What is the Plane of Music", "What information", and "What new direction". Follow dialogue with Spirit of Ao the Fourthborn at location +196, -962 in Arcstone (at the Relic portal) and complete the three Skylance tasks. Skylance: The Library, which takes place in the Skylance library. Skylance: The Oubliette, which takes place in the Skylance oubliette. Skylance: The Laboratory, which takes place in the Skylance laboratory. Receive Tarnished Chime upon completion of Skylance: The Laboratory. Give the Tarnished Chime to Spirit of Ao the Fourthborn to receive a Harmonic Chime. Give the Harmonic Chime to Arch Mage Galsin. To Galsin, say "What whispers" and "What complications" to receive a Silent Harmonic Chime. Go to Oathmir the Outcast at the zone-in of The Devastation and say "Tell me about the chime." Give the Silent Harmonic Charm to Oathmir. He will tell you about corruption in Razorthorn and give you the Silent Harmonic Chime back. To Oathmir, say "I can find out" to request the Samples of Corruption task. You must have an Enraged Flesh Charm to request this. If you have not completed the Become the Vessel task, you will need to group with someone who has, and have them request the Samples of Corruption task. Complete the Samples of Corruption task which takes place in the tower of Razorthorn. Give the Silent Harmonic Charm to Oathmir the Outcast to receive a Twisted Chime. Hail Arch Mage Galsin and give him the Twisted Chime to receive a Twisted Chime (this is a different item). To Galsin, say "What solution". Follow dialogue with Tak`Valnakor at location +6885, -1350 in North Ro and complete his three tasks. The Key to the Past, which takes place in the Root of Ro. 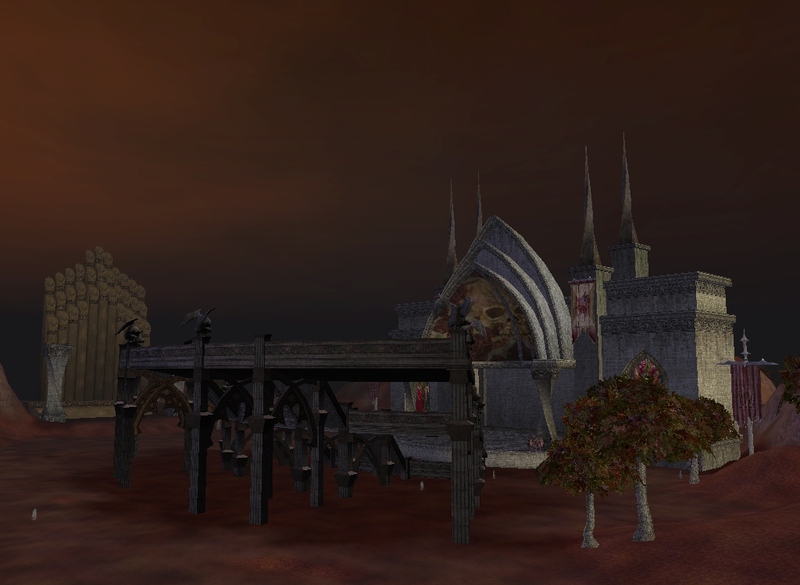 The Burning Prince, which takes place in an instanced Ruins of Takish-Hiz. Message from the Past, which takes place in an instanced Ruins of Takish-Hiz. Go to Queen Tak`Yaliz in North Ro at location +5945 -2090 and say "What Twisted Chime" to her. Give the Twisted Chime to Queen Tak`Yaliz to receive Twisted Harmonic Chime (with no effect). Give the Twisted Harmonic Chime (with no effect) to Arch Mage Galsin in Arcstone to receive the final Twisted Harmonic Chime. This item has the effect "Alter Plane: Theater of Blood" on it. In addition, you will be granted an AA with the same effect under your "General" tab. They are on seperate timers. You must have the Twisted Harmonic Chime and Enraged Flesh Charm in order to be granted Deathknell access. Hail Emissary of Druzzil at the entrance to Arcstone in West Freeport. To him, say "proposition", then "I am interested" to receive a Shard of Mana. 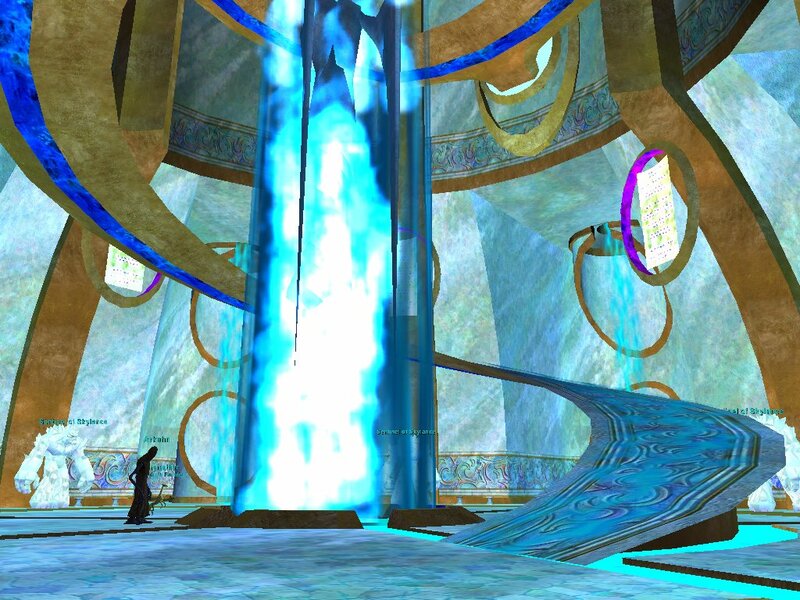 In order to request the Daosheen raid, you must complete the Entrance to Daosheen's Chamber task from Arch Mage Sarcrynn. This step is not required for Deathknell. Go to the Shrine of Druzzil Ro in Arcstone and hail it. To the Shrine, say "What task", "What enchantment", "What steps", and "I am willing". 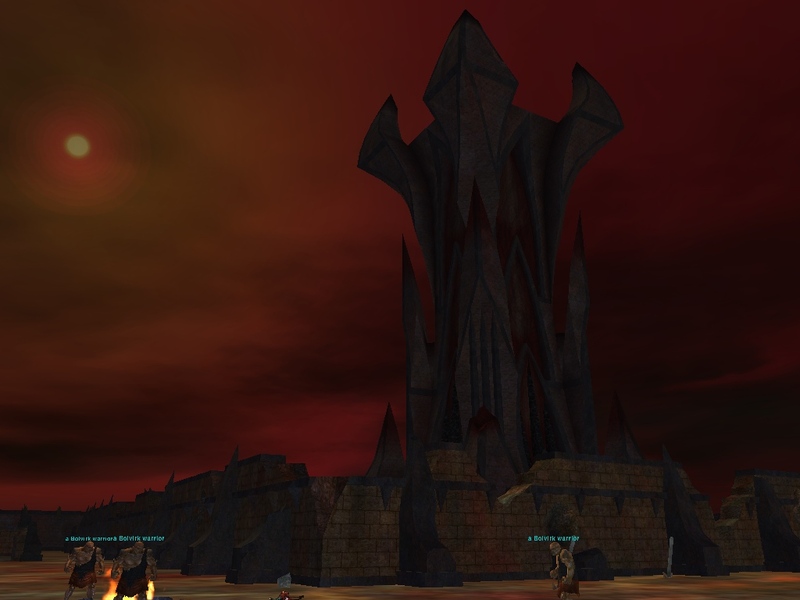 Participate in a successful raid on Sullon Zek in this task given by Oathmir the Outcast, which takes place in Razorthorn, the Tower of Sullon Zek. In order to request the Sullon Zek raid, you must collect the three Legendary Berserker Bones and, with your Enraged Flesh Charm in your posession, give the bones to Grand Librarian Maelin. Once you do that, Oathmir will grant you the raid. When Sullon Zek dies, your Shard of Mana turns in to a Glowing Shard of Mana. Participate in a successful raid on Suchun, the Blood Warden in this task given by Tak`Valnakor, which takes place in the Lair of Suchun. In order to request this raid, you must have completed Tak`Valnakor's quest arc. But, you've already done that, right? Upon the deaths of Suchun and his minions, your Glowing Shard of Mana will become a Black Shard of Mana. Go to the Shrine of Druzzil Ro and hail it. (Follow any dialogue to its end -- you will be directed to go to the Theater of Blood. You likely need to give the Black Shard of Mana to the Shrine of Druzzil Ro). Find Eodue the Pure, a fairy wandering the zone-in of the Theater of Blood. Hail her, ask her about her six companions by name, then ask "What curse" and "What source". Give the Inspiration to Eodue the Pure to receive your Deathknell flag. Event Coordinator Baublie Diggs at location +600, +135 in West Freeport offers evolving tradeskill trophy tasks based on your skill level in various tradeskills: Beginner (50-99), Apprentice (100-149), Freshman (150-199), Journeyman (200-249), Expert (250-299), and Master (300). The tasks are listed on this page. Knight Champion Eddard, just outside the arena in East Freeport, offers this group task in which you upgrade a charm called Arena Champion's Badge by fighting off waves of mobs in the Freeport Arena. Numerous quest NPCs in East Freeport and West Freeport are on Freeport Citizens faction. They offer tasks for levels 45+ which take place in and around the city, as well as in instanced sections of Freeport. How is your Plane of Growth faction? If it is intact, check out this task offered by Speaker Grayleaf at location +880, -305 in the Elddar Forest. A simple delivery nets you a cloak (for casters) or belt (for melees) with 165-175hp/mana/end. Spirit Hunter Azmaro at location -280, +1670 in Arcstone offers this unrepeatable task which yields around 75% of an AA in experience for ~10 minutes of work, assuming you can handle yourself sneaking around Arcstone. Borso at location +1085, -615 in Relic offers two tasks which each yield either a ring or earring with ~200hp/mana/end. The Arena Overseer at location +160, +550 in Relic offers this groupable task for which casters receive a 205hp/215mana necklace and melees receive 190hp/200mana/200end veil. Apprentice Mage Sarcrynn at location +130, -1040 in Arcstone offers this task which ends in an augmentation called Black Orb of the Scrykin. Completion will require some raids. Upon killing an NPC in Sverag, Stronghold of Rage, you may be prompted for this task, which takes place in Razorthorn and can occasionally yield (on hard) some decent augmentations. Shalowen the Pure at location -5, -125 in the Elddar Forest offers a series of tasks in which you investigate the corruption among some Elddar elves. Each tasks yields its own loot, and if you beat all three plus the raid task, do a final turn-in to receive the augmentation The Chalice of Life. #1 - Investigating the Elddar, which takes place in Tunare's Shrine. #2 - Questioning the Priest, which takes place in Tunare's Shrine. #3 - Key to Corruption, which takes place in the Elddar Forest. Raid - The Corruption of Ro, which takes place in Tunare's Shrine. If you found yourself running from Lockjaw in your early days, you'll probably appreciate this task from Dimbwicket Middifoodle at location +2485, -2660 in South Ro. It is a low-level faction task, but recommended for everyone at least once. We won't spoil the ending here. Many more missions were added with the Prophecy of Ro expansion. The list here is made up of some of the highlights. A complete list of PoR quests and tasks listed in the Allakhazam database can be found here (this is a premium-only link). Lady Usher at location +200, +1685 in Arcstone, offers this task in which you can gain a set of armor. Bards receive Prismatic Scaled Armor. Beastlords receive Armor of the Wildkin. Berserkers receive Dark-Alloy Armor of Rage. Clerics receive Armor of the Harmonious Soul. Druids receive Woven Bramble Armor. Enchanters receive Armor of Persuasion. Magicians receive Elemental Essence Armor. Monks receive Armor of Celestial Discipline. Necromancers receive Armor of the Whispering Soul. Rogues receive Armor of Stolen Fate. Shamans receive Armor of the Fates. Warriors receive Armor of the Blessed Champion. Wizards receive Armor of Prismatic Power. Class-specific armor drops in the Theater of Blood. For each set, the legs and chest pieces are dropped by a named mob while the other pieces are dropped by 'trash' mobs of the same type. Bards' Armor of Vesagran is dropped by screaming banshees (named: Soulwail). Beastlords' Spirit Totem Etched Armor is dropped by shadowmane feralists (named: Talili). Berserkers' Vengeful Blood-Alloy Armor is dropped by dervishes (named: Bleeding Storm). Clerics' Armor of Superior Divinity is dropped by wailing banshees (named: Lilia, the Rancid). Druids' Everliving Bramble Armor is dropped by living vines (named: The Festering). Enchanters' Armor of Eternal Eloquence is dropped by truefaith coercers and enticers (named: Belinda Baleheart). Magicians' Primal Element Armor is dropped by bloodbonded archimages and elementalists (named: Master Chrichus). Monks' Armor of Transcended Immortality is dropped by screecher bats (named: Painscreecher). Necromancers' Armor of Whispered Death is dropped by truefaith deathcasters and deathdealers (named: Mistress of Malady). Paladins' Armor of Night's Bane is dropped by wandering steeds (named: The Skeletal Steed). Rangers' Petrified Heartwood Armor is dropped by treants (named: Leafrot). Rogues' Entropic Nightshade Armor is dropped by ancient sentinels (named: Shatterstyr). Shadowknights' Armor of Wailing Hatred is dropped by shaded steeds (named: Illixes, the Dark Dream). Shamans' Spirit Blessed Armor is dropped by shadowmane spiritualists and spiritseekers (named: Fangore Boneclaw). Warriors' Armor of Eternity is dropped by rotting and decaying husks (named: Sir Savagery). Wizards' Armor of Phenomenal Power is dropped by bloodbonded firestarters and spellslingers (named: Aesthir the Delusioned). This page last modified 2015-08-12 14:36:45.